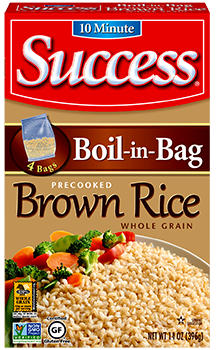 Success® Rice, the ORIGINAL Boil-In-Bag Rice, is a 10-minute quick-cooking long grain rice that is pre-measured in a convenient colander Boil-in-Bag. 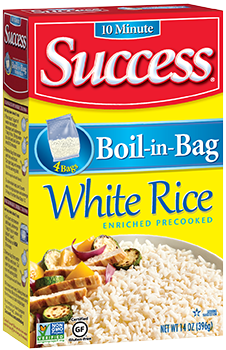 The Boil-in-Bag and the unique cooking quality of Success Rice guarantees perfect rice every time. 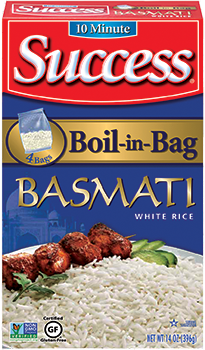 Keep a box of regular white, brown, Thai Jasmine or Basmati rice on hand for easy to prepare rice on the stove or in the microwave. Success® products are guaranteed perfect. Boil-in-Bag quick-cooking brown rice, with similar nutritional benefits of long cooking brown rice but ready in one-fourth the time – only 10 minutes. 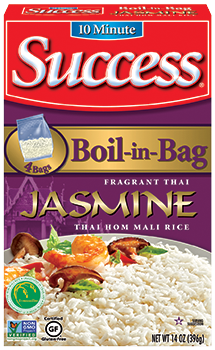 Fragrant, aromatic or scented long grain rice available in a boil-in-bag. When cooked it is soft and fluffy with a taste that enhances traditional spices of Oriental cuisine. 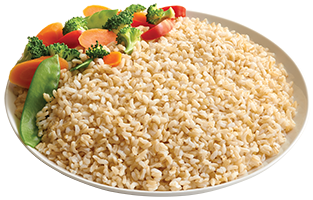 Aromatic, long-grain rice grown in the foothills of the Himalayas. The grains of basmati rice are long and slender and when cooked, stay separate and fluffy ... the perfect accompaniment for Asian, Middle Eastern and traditional dishes. 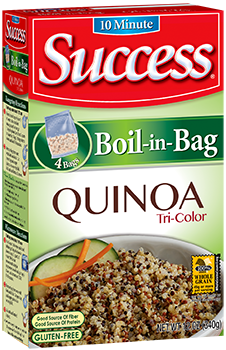 NEW: Success® Tri-colored quinoa in a convenient boil-in-bag. 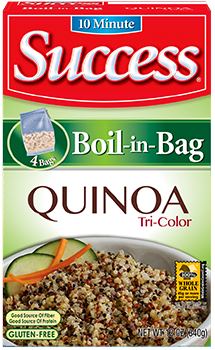 With a 10-minute cooking time, Success Quinoa is light and fluffy with a nutty flavor, plus it’s a good source of fiber..